Home Latest News Polisario: What is behind Nouakchott’s decision to declare border with Algeria “closed military zone”? 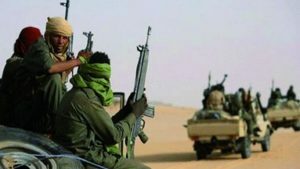 Polisario: What is behind Nouakchott’s decision to declare border with Algeria “closed military zone”? Nouakchott’s decision to declare the border with Algeria a “closed military zone” did not come out of the blues. The seizure a few days later of weapons and drugs in a vehicle coming from the Polisario-run camps in Tindouf confirmed the fears of Mauritanian authorities. The 4×4 type vehicle was spotted thanks to the aerial surveillance system established in this region, the Mauritanian army said. Yet, Nouakchott deliberately omitted to indicate that the vehicle was driven by elements of the Polisario, as the Mauritanian army only said that the SUV belonged to a network of drug traffickers. In any case, this new incident supports the many reports of Western intelligence agencies on the proliferation of arms and drug trafficking in the region. The trafficking activities are mainly conducted by uncontrolled elements of the Polisario, the Algeria-backed separatist front, putting into question Morocco’s sovereignty over Western Sahara. Western intelligence agencies are particularly concerned about the connections between drug traffickers and jihadist groups, as terrorists receive dirty money from traffickers to finance their operations in northern Mali and, more generally, in the countries of the Sahel. Actually, operations involving both sides are on the rise in the region. The latest was in June when half a dozen international drug and psychotropic products traffickers were arrested in Morocco. An Algerian, a Malian and two members of the Polisario were among the gang members. Such cases illustrate the extent of cross-border trafficking in this region where the Polisario camps have become a trafficking hub.